We all sing in church or synagogue, in the car or in the shower. But many of us are about about our ability or about singing in front of others. The Chordsmen want to help you get the most beautiful sound possible from your voice with the confidence to perform. Our director with over 20 years of vocal teaching experience will inspire you event if you can’t read music. Join us beginning Monday, February 4, 2019, 6:45pm at Kol Ami Synagogue | 252 Soundview Road | White Plains, NY 10606. Register in advance at chordsmen.org/ready-set-sing | by phone 914-298-SING (298-7464) | just show up! The Westchester Chordsmen Chorus is a 501(C)3 not-for-profit performing arts group. Its mission is to spread the joy and fun of singing around to the community, the country and the world. 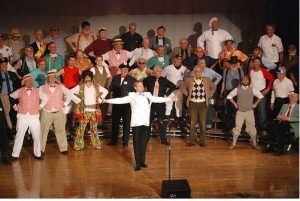 The Chordsmen’s musical repertoire extends beyond its barbershop-style roots to Broadway show-tunes, doo-wop, traditional, gospel and contemporary songs arranged in four-part a cappella harmony for tenor, lead, baritone and bass singers. The Westchester Chordsmen Chorus offers FREE singing lessons as a community service.